​The Schipperke is a small breed, similar in appearance to a spitz, that originated in Belgium. It is most often stated that these little dogs accompanied Dutch and Belgian canal boatmen, living out their lives as ratters. However, there is little evidence to support this repeated tale, which first appeared in the 19th century. It was far more common to find them in the homes of the middle class and craftsman. Any ratting they accomplished was likely done on land along with watchdog duties. The origin of the name Schipperke is one that is heavily debated, and most theories tie back to the boatmen legend. These include the Flemish words “schipper” and “schip”. The former being translated to “skipper”, the later “boat”, making it “the little boatman”. A third, less popular theory is that its name is from another Flemish word “Shapocke” or “Scheperke”, meaning “Little Shepherd”. The Schipperke has existed in Belgium since at least the 1400s. Its origin is debated but falls into two primary theories. The first is that it descends from a now extinct black sheepdog called the Leauvenaar, an ancestor it would share with the Groenendael. Alternatively, it belongs to the spitz family and is possibly related to the German Spitz. A more likely theory is that both are correct. Perhaps the Leauvenaar was originally crossed with a smaller breed to miniaturize it. However it came to be, the Schipperke remained largely with the working class until it caught the attention of Queen Marie Henriette in 1885. Once it gained her favor it quickly became a favorite household dog throughout Belgium by the end of the 19th century. 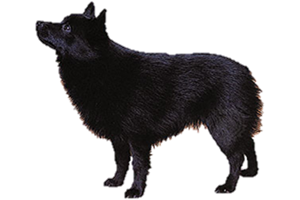 The Schipperke first arrived in England in 1887 (which was when it began being called a barge dog) and the United States in the following year. Is the Schipperke Right for You?